Nellie Sue Potter illustrates trail guides and shows her award-winning botanical illustrations at the Canadian Museum of Nature in Ottawa. But don't let her skills intimidate you. Nellie Sue is a patient teacher who brings out the best in her students. She also has a deep love and contagious enthusiasm for High Park's black oak savannah plant community. Nellie Sue will be bringing her passion for this local biodiversity to High Park Nature Centre on Oct. 21 for the Autumn Tree Drawing Workshop. We feel really lucky to have one of the leading Canadian botanical artists leading this workshop. We had a few questions for Nellie Sue and she generously responded. HPNC:What excites you about working with budding artists? Nellie Sue: The unique vision each one brings to their art. HPNC: Which species of tree is your favourite to draw? Nellie Sue: I love them all! I will say, though, that a mature tree with an interesting trunk and branches is always a pleasure to draw or paint. HPNC: What makes High Park a good place for botanical art? Nellie Sue: It provides an opportunity to observe plants in their natural habitats, and there is a diversity of plants to observe. HPNC: What are three of your ‘go to’ art supplies? Nellie Sue: Good pencils, good eraser and abundant paper! HPNC: What is something you’re looking forward to for the Autumn Tree Drawing Workshop on October 21st? Nellie Sue:The camaraderie, good will and interest of the group of people who will gather on October 21st to draw trees, a tree or tree parts. Fall is an especially good time to appreciate trees! Nellie Sue’s love and appreciation for the natural world is evident in her artwork and art teaching. Her work experience includes working as a botanical illustrator, teaching art to children, and teaching botanical art to adults. Her teaching venues in Toronto include the Royal Ontario Museum, Toronto Botanical Garden, and now her very own teaching studio, Nature Art Studio, on Dundas Street West, in the Junction area, north of High Park. Nellie Sue has had 3 solo exhibitions in Toronto, including one at Toronto City Hall. She has exhibited with the Botanical Artists of Canada (BAC) in four national exhibitions and has received numerous awards, including first place in 2015. She also exhibits regularly with the Southern Ontario Nature and Science Illustrators (SONSI). In 2018, she has 2 artworks in the international exhibition “Botanical Art Worldwide”. 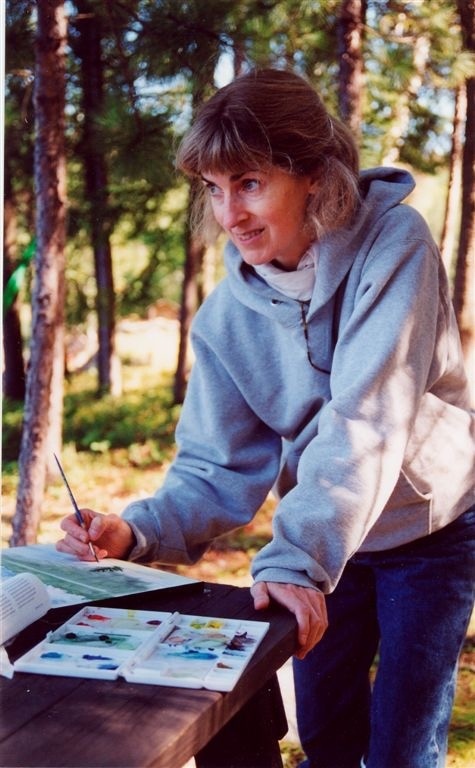 Her botanical artwork has also appeared in trail guides and other publications. She is a member of the Botanical Artists of Canada, The Guild of Natural Science Illustrators, the American Society of Botanical Artists and the Southern Ontario Nature and Science Illustrators.